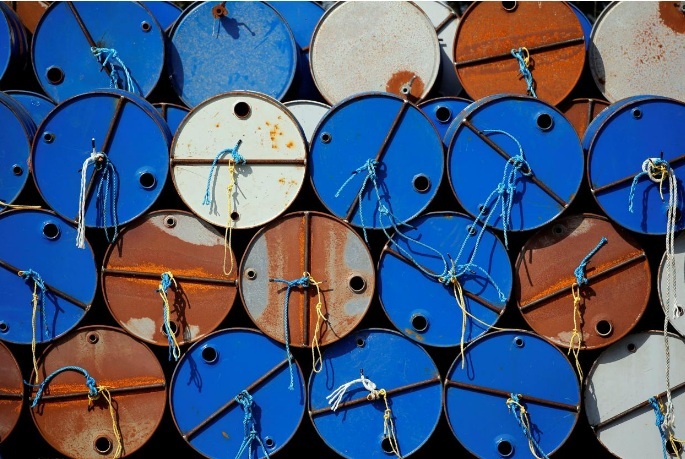 Oil barrels are pictured at the site of Canadian group Vermilion Energy in Parentis-en-Born, France, October 13, 2017. SINGAPORE - Oil prices rose on Wednesday, lifted by a fall in U.S. crude inventories and concerns that tensions in the Middle East could disrupt supplies. Brent crude futures LCOc1, the international benchmark for oil prices, were at $58.27 at 0314 GMT, up 39 cents, or 0.7 percent from their last close - and a third above mid-year levels. U.S. West Texas Intermediate (WTI) crude futures CLc1 were at $52.13 per barrel, up 25 cents, or 0.5 percent, and almost a quarter above mid-June levels. Traders said that on charts for WTI a technical pattern known as a ‘Golden Cross’ was approaching, in which the 50-day moving average price climbs higher than the 200-day moving average, which is widely seen as a bullish price indicator. Traders said that prices were pushed up by a drop in U.S. crude inventories as well as concerns that fighting in Iraq and mounting tensions between the United States and Iran could affect supplies. U.S. crude inventories fell by 7.1 million barrels in the week to Oct. 13 to 461.4 million barrels, the American Petroleum Institute (API) said late on Tuesday. “API data from the U.S. overnight showed a big draw ... If $52.83 in WTI and $59.22 in Brent give way, then oil is stepping into a new and much higher range,” said Greg McKenna, chief market strategist at futures brokerage AxiTrader. Official U.S. fuel inventory data is due later on Wednesday from the Energy Information Administration. Adding to a tightening U.S. market, tensions in the Middle East meant that a risk premium was being priced into oil markets. Iraqi government forces captured the major Kurdish-held oil city of Kirkuk earlier this week, responding to a Kurdish independence referendum, and there are concerns that fighting could disrupt supplies. “In the case of Kurdistan, the 500,000 barrel-per-day (bpd) Kirkuk oil field cluster is at risk,” U.S. bank Goldman Sachs said on Tuesday. The Iraq crisis adds to a looming dispute between the United States and Iran. U.S. President Donald Trump last week refused to certify Iran’s compliance over a nuclear deal, leaving Congress 60 days to decide further action against Tehran. Oil prices rose on Wednesday, lifted by a fall in U.S. crude inventories and concerns that tensions in the Middle East could disrupt supplies. Brent crude futures LCOc1, the international benchmark for oil prices, were at $58.27 at 0314 GMT, up 39 cents, or 0.7 percent from their last close - and a third above mid-year levels.